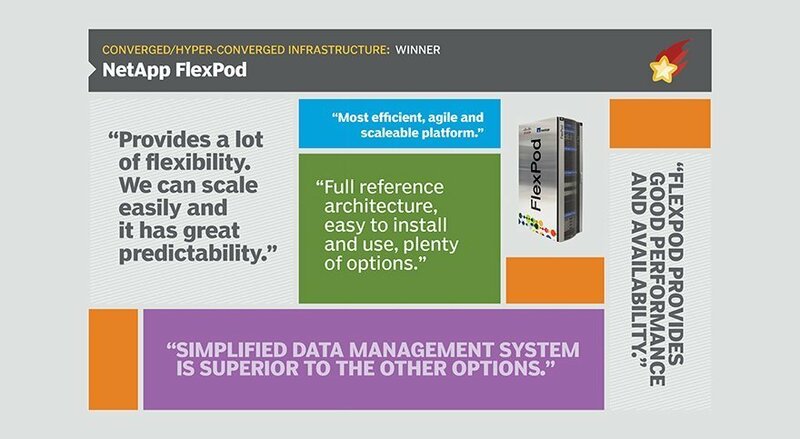 Flexibility and scalability, among other benefits, helped NetApp FlexPod achieve its first win for Modern Infrastructure's Best Converged and Hyper-Converged Infrastructure Product Impact Award. NetApp's FlexPod is a converged platform reference architecture that incorporates Cisco UCS servers, Nexus switches and NetApp FAS storage arrays. The platform is available in three different configurations within the data center. Those with a traditional data center setup can use FlexPod Datacenter, which includes a full-height rack of equipment; organizations with specific workloads such as Hadoop big data can use FlexPod Select, an a la carte system; and FlexPod Express is designed for quick deployments in remote or edge data centers. The specificity of each design allows FlexPod to be tailored to an organization depending on its needs. Because NetApp FlexPod is an open, flexible infrastructure, it enables the platform to easily integrate with other NetApp infrastructure, said Reinoud Reynders, IT manager of infrastructure and operations at UZ Leuven Belgium, a large healthcare provider. Although Reynders isn't a FlexPod user, his organization has been a NetApp customer for 16 years. NetApp products have been crucial to support the company's two on-premises data centers and additional remote backup data center, he said. "When you're a customer for 16 years in a critical environment such as ours, that means that there is definitely an added value that NetApp provides," Reynders said. "Otherwise, we would've already changed to another vendor." FlexPod's Cisco compute layer is one of the infrastructure's strongest components, Reynders added. NetApp and Cisco have been in a partnership since 2003. A more recent partnership adds value to the FlexPod platform, as well. Earlier this year, NetApp acquired SolidFire, an all-flash array platform. SolidFire's flash storage option is now available as an add-on for the FlexPod environment, which enables automation, further agility and scalability and raises operational efficiency. SolidFire's latest operating system, Flourine, includes support for VMware VVOLS and greater VM integration. "[FlexPod] is a mature, yet evolving and flexible product that creates stability and consistency in an IT organization," one voter said. "No matter if a customer needs to keep data on site, in the cloud or mixed in a hybrid infrastructure." How confident are you that NetApp FlexPod and similar platforms are making converged and hyper-converged technologies broadly appealing to IT shops?